One of the many perks of working in the tourism industry are nights like this. Let me break it down for you! The Rocky Mountaineer Train passes through Kamloops six nights a week and brings thousands of visitors to town during the summer months. Because we are not able to speak to all those visitors and let them know where to go and what to see in Kamloops, we do the next best thing! Each spring, we host all the new onboard staff and take them on a progressive tour of our downtown core, sampling and drinking from one end to the other. This gives each RM onboard attendant a first hand look (and taste) of what Kamloops has to offer so they can make the best recommendation for their guests. This year we hosted a group of 70! 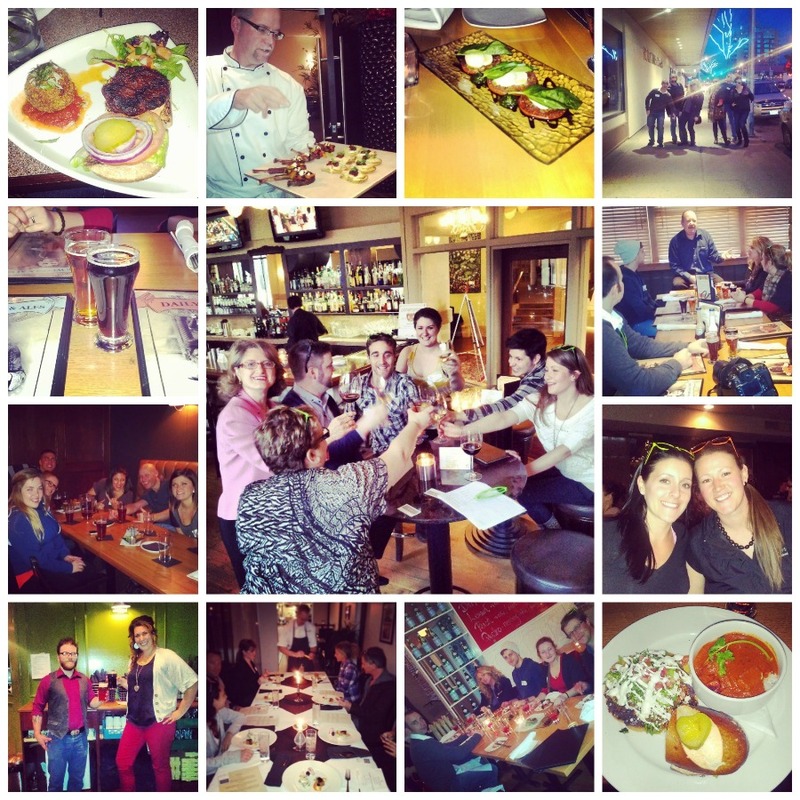 And with 12 participating restaurants, it was a progressive tour for sure! The group splits into smaller pods and each of our Tourism Kamloops staff members leads a group, rotating through each restaurant with only 20 minutes to drink, eat and learn about what it has to offer. This night is always a fun time and it is so great to be able to interact with the new onboards and connect them to our passionate restaurant owners and let them experience our great selection here. And a selection they get! This year, we all started up at Prestons Restaurant in the new Coast Hotel. With an amazing view - we enjoyed freshly made sushi, chicken satay and goat cheese tapas. The presentation and ambience was first class! After that, we bused downtown and started the walking portion of our tour. We spilt into two groups, each sampling a handful of restaurants... 5 in the west end and 5 in the east end. I was in the East End Group. First stop - Crush Sauté & Grill. Locally owned, this restaurant has a relaxed vibe with a real passion for using local ingredients. Then there was Frick n Frack... a restaurant that aims to please with their HUGE selection of bottled and draft beers! Take a trip around their world with food and brew selections that will appease people from all walks of life. Make sure you say hi to General Manager Adrian if you go - he is a real character and adds a touch of &apos;local charm&apos; to the experience. After downing a few beer samples and delicious tasters, we popped across the street to Blue at the Hotel 540. Although it won&apos;t be open until May, we were able to have a sneak taste of some of their menu offerings and oh boy, it was delicious! Tender pieces of duck and lamb were served followed by homemade chocolate granola bites. My mouth is watering just thinking about it. Then it was over to Quattro (formally Felix on Fourth), a little bistro that offers a unique spin on Italian. With an open kitchen concept and limited seating, this intimate restaurant is the perfect location for ‘a’ special dinner out. When you go - try the Quattro martini - you won&apos;t regret it! Hot House Bistro was the 6th restaurant up and is always a pleasure to visit. This quaint restaurant boasts itself as being "Creators of Real Food" and lives up to the title. Everything was fresh and full of flavour! Something I never thought I would like in a millions years was their avocado ice cream, but, it was love at first bite! I&apos;ll be back. The second group did the west end of downtown with their first stop at The Commodore.... have you been? Either way, their bruschetta is famous in Kamloops... so fresh and flavourful! A huge hit with the vegetarians in the group was their mushroom poutine! After dinner, stay and dance the night away with live music or house music. Hopping across the street to Terra Restaurant next - the groups really enjoyed a 3-course &apos;taste&apos; presented by head chef and owner, David Tombs. Using local meats and produce, the freshness and flavour in their dishes is bar-none. Next up was Kelly O&apos; Bryans - a local hotspot that has been around for years. Pachoes, pachoes, pachoes and chicken lips were on the menu this night and never seem to disappoint. Maurya&apos;s Indian Restaurant was 4th up and in typical indian fashion, the spread of food was more than enough. From korma to pakoras and hand stretched naan - nothing can really compare to the rich flavours that can only be found in Indian cuisine. If the groups weren&apos;t already stuffed, they were when they left Maurya&apos;s! Lastly was The Plaza&apos;s newly renovated Fireside Steakhouse Grill. Hands down, everyone loved &apos;The Dougie" burger made with fresh, local Haughton beef. Sitting fireside, toasting some great wine and enjoying delicious looking beef... what more can you ask for? Lastly, all 70 of us met up at The Noble Pig to end our night. The always generous General Manager Meaghan Herman, kept the beer and deep fried pickles flowing and gave each of the groups a tour of the brewery which really adds to the experience of a brew house. They do an awesome job of catering to groups large and small. Overall... its nights like these that make me say: "I LOVE MY JOB!"